New Ignition Cylinder Information – Welcome to the EMIT Technical Forum! Note: These pages are only available on EIM versions 2.00 and newer. 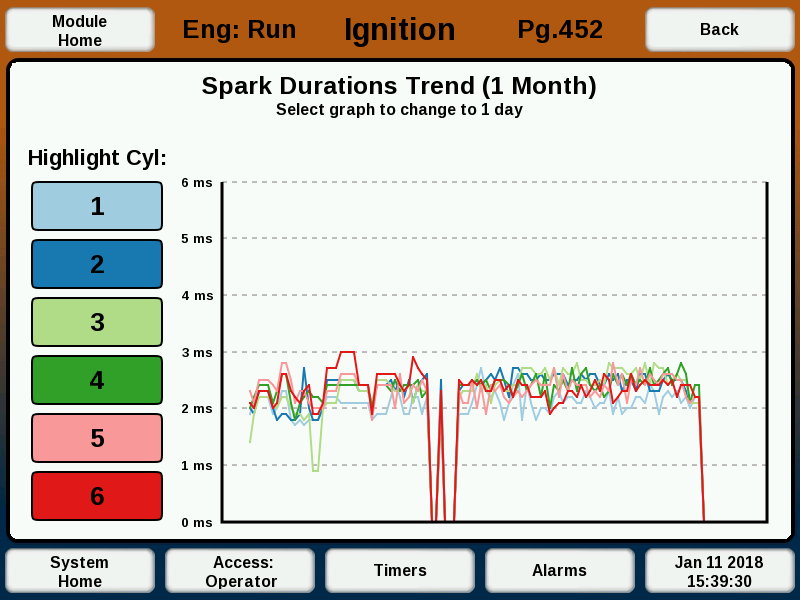 The spark information screen is reached by selecting the spark duration bar graphs on the ICM home page. This page is shown below. If using more than 8 cylinders, a button will be shown that switches between the upper and lower half of cylinders, since the page will only show up to 8 cylinders at once. On the left side of the screen is the spark durations. 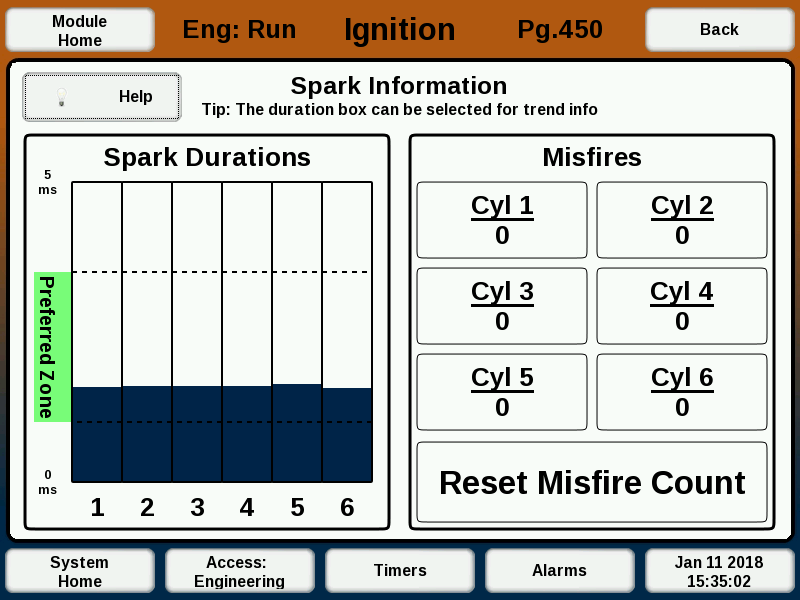 In general, the spark durations should be relatively steady and similar between cylinders. If one cylinder is much longer or shorter, it may have issues with the plug, coil, wiring, or cylinder compression. The preferred duration zone is shown. If too short, the combustion may be weak and incomplete. If too long, plug life will be shorter and there could be detonation issues if the plugs heat up too much. On the right side of the screen the misfire count for each cylinder is shown. These will accumulate indefinitely from power up. Sometimes a few misfires will be registered over time without being an issue. If one (or multiple) cylinders have many misfires in the past, the plugs and wiring should be checked. Selecting the 'Reset' box will clear the counts to zero. 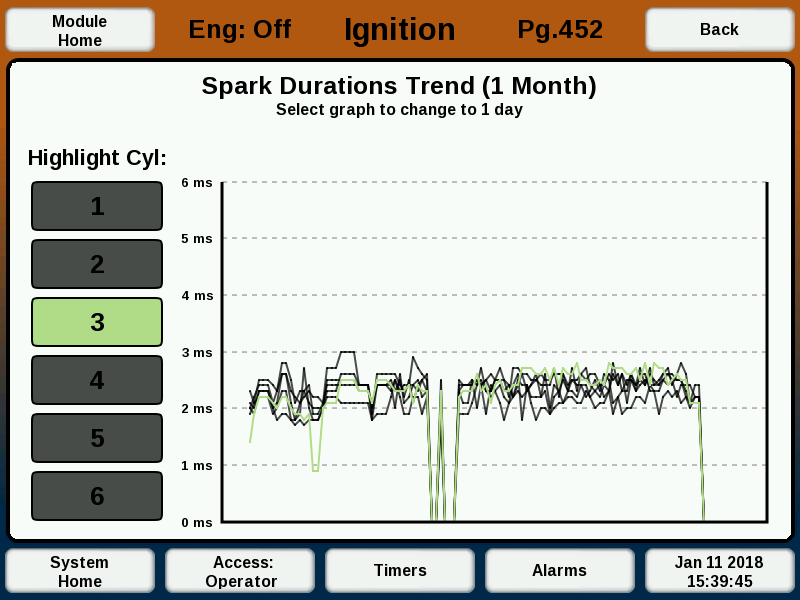 Selecting the 'Spark Durations' box will bring up the spark trend page shown below. The spark trend page shows up to 8 cylinders at once for the last one month. This page can be used to see if there is a trend in spark durations. If the sparks have been trending downward a fair amount, the plugs may be reaching time to be changed. This is the same information that is contained in the normal one-month ICM data log, but graphed out at once. The graph can be selected to cycle between graphing one month and one day of data. Selecting one of the cylinder boxes on the left will highlight one cylinder's trend line to more easily compare it to the others.